Today is my beautiful boy’s birthday. It’s hard to believe it’s been 3 years since I walked laps around the neighborhood, struggling with the weight of my belly. Three years since I felt the uncertainty of life to come and more than a little nervous about adding to our family. Three years since my beloved Grandma was with us, really. 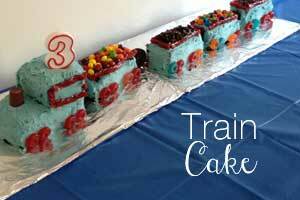 This cake was very fitting since I felt like she was with me using this recipe to make my son’s train birthday cake. She was an AMAZING baker and cake-decorator and taught me to ice cakes. I never really had the patience for it, but she sure did. My son asked me to make this chocolate cake originally for our holiday we celebrated in October, and it was so good he asked me to make it again for his birthday but this time as a train with an engine for his candle and train cars carrying supplies. I then made it a THIRD time in one month in the form of cupcakes for his classroom birthday party celebration. I got this chocolate cake recipe from Add a Pinch, one of my very favorite cooking sites. 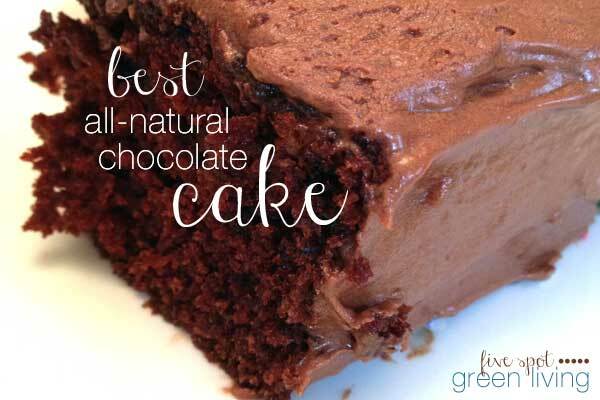 I love that it’s a completely all-natural and from scratch homemade chocolate cake recipe. We know exactly what’s in it. And come on, folks – it’s really not that hard. A few more steps, yes, but definitely worth it to know what you are serving your family when you are supposed to be celebrating (not handing a plateful of preservative and additives). I did not have espresso powder, so I actually used a cup of coffee in the cake. I also found this chocolate frosting recipe by accident. I was reaching for the powdered sugar when I realized I didn’t have enough. YIKES! Now what?! I decided to look at the ingredients I DID have and figured out how to make a chocolate frosting using white sugar on the stove. It was a little scary as the texture is really different than making buttercream with the mixer. So if you need a chocolate frosting recipe without powdered sugar (or confectioner’s sugar) this is the one. It uses flour and you basically make a roux to start but it’s worth the weirdness. I forged ahead, despite the weird bechamel-consistency of the frosting and when it was ready and cake frosted, I allowed the kids to decorate with (shhhh!) artificially-flavored sprinkles. Yes, even I, the Happy Green Mama of Five Spot Green Living, allow some non-natural substances every once in a while. 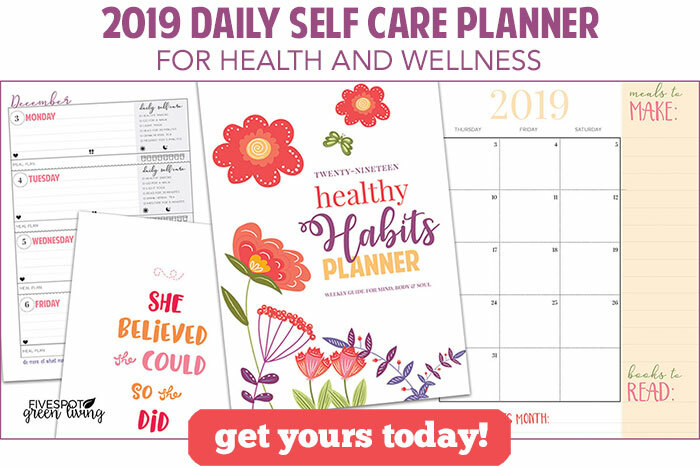 I know with kids it’s hard to do absolutely everything natural and healthy ALL the time! So here we go. The now-famous chocolate cake of our household that is really so much better if you store it in the fridge. Cold chocolate cake, really?! Please. You are going to have to lock the refrigerator to keep me away. [yumprint-recipe id=’9′]And, of course, the FROSTING!! My kids loved this part and could hardly contain themselves until I let them have the bowl! Do you have a dessert you just have to make for certain holidays? For more birthday and holiday goodness, check out these links! Green Birthday Series: Kids Birthday Survey and FREE Printable! Did I miss something? I see chocolate frosting recipe, but no coco in the directions? Oh no! This recipe is originally for vanilla frosting and I adapted it for chocolate. I added about 1/4 cup unsweetened cocoa powder and add more if desired. You can also melt some chocolate chips to add to mixture if desired. Enjoy! Are you making this for NYE? Do I need a specific type off coffee? No – I used 1 cup of regular coffee. I think the original recipe called for 1 tsp espresso powder plus 1 cup boiling water. How much espresso powder do you add? The original recipe called for 1 tsp espresso powder and 1 cup boiling water. I cannot wait to try making this! It looks wonderful and let’s face it, kids make the best critics. They are brutally honest so I am going with your son’s opinion! I think I would love to run in and make the frosting right now! Never seen a recipe like it before. This sounds great. Thank you for sharing your recipe! I love chocolate cake. I will have to give this recipe a try. Thank you for sharing. Wow! I’m loving this recipe! I just made it and it turned out fabulous! Thanks for the great recipe! My son loves chocolate!! I need to try this one. I might try it next week for fun. It sounds so yummy. Thank you for linking up to Party Time and we hope to see you again next week! This cake sounds delicious! I totally want to try the alternative frosting. It’s would be great having an option for those times I am out of powdered sugar.